Suspicious Heuristics: Busting the 'egg scandal' wide open. These eggs were not broken to make an omelet. Recently, Wright County Egg and Hillandale Farms, both located in lovable Iowa, have come under fire for "poisoning" the public with salmonella from their eggs. An egg source for 13 different retail brands, this news has rocked supermarkets nationally, and an even wider recall might be in the works. "The history of ignoring the law makes the sickening of 1,300 and the forced recall of 550 million eggs shockingly understandable," says William D. Marler, a Seattle attorney representing someone who became ill from a 'dangerous' egg salad. (They're all dangerous in my opinion, especially on a hot day). The numbers above got me wondering. What proportion of the recalled eggs were contaminated with salmonella? If 550,000,000 eggs resulted in 1,300 people becoming sick, the chance of any one egg making someone ill is .000236% . 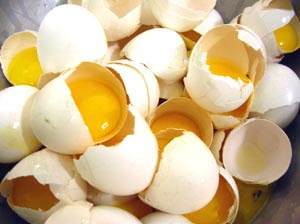 Eat a whole dozen, and your odds skyrocket to .0028%, a roughly one-in-35,000 chance of becoming ill from a tainted egg. Surely, if you're one of those 1,300 people, hearing the numbers won't cure your stomach-ache and flu symptoms, but it should be reassuring for the other 99.99% of the population. Salmonella can be dangerous for the very young and very old, but many cases are so mild they aren't even reported. Some media outlets, such as the Huffington Post, have taken this story and run with it, using those salmonella cases as a biting indictment of mass-produced food. Their title "Cheap Food Makes You Sick" seems to capture the gist pretty well. One thing they leave out is that cheap food can also make you healthy. Eggs are an excellent source of B-12, omega fatty acids, and other vitamins essential for good health. When you compare rickets, scurvy, and beriberi to a mild risk of salmonella, puking for a few days might be the healthiest decision. Basically, it's all very well and good for rich people to say that everyone should drop $4.99 for a carton of organic eggs, and who cares about the cost of sending back 550,000,000 potentially tainted eggs? Yes, it'd be tragic if someone died from eating a bad egg, but it's also terrible for the Iowa farm workers, their families, and the agricultural community in general which will likely bear the cost of this recall. Additionally, thanks to the hype surrounding those few salmonella cases, consumers might be deterred from eating their eggs into the future, harming both the farm economy and public health. Roughly 40,000 salmonella cases are reported per year in America, which makes the egg issue look like a drop in the bucket. Instead of a costly recall, more measured responses could have been taken to contain the "outbreak" of salmonella. Perhaps the best advice on the subject yet: avoid cookie dough and cook your breakfast thoroughly. I may have to give up Eggs Benedict for a few days, but in the larger scheme that's not such a big deal. I'm not sure the same can be said for wasting billions of dollars in eggs. Think of the sad chickens, if nothing else. Can't blame Walmart, the last thing they need is more bad press. No one has gotten sick - yet - so maybe it was done in time. I just wonder, how many millions did it cost to give us that peace of mind?